Rings are both magical and emotional, throughout history they’ve held symbolic significance. Apart from their romantic connotations, rings have a new place in the fashion league where designs range from exquisitely decorative to beautifully simple. Whether worn singularly or in multiples, you can make a fashion statement. Why not mix and match for the most impact to add glamour and versatility. Wedding rings come in many different styles, metals, settings and of course, prices – the choice is endless. The key is to choose a ring that reflects your individual style and taste. Other important factors to consider when choosing a wedding ring are your budget and lifestyle. 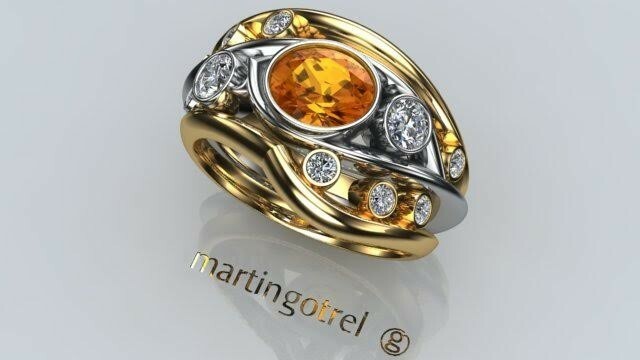 Martin believes that couples should buy “the finest quality ring that you can afford as this will always stand the test of time better than anything else.” At the end of the day you should go by your gut instinct. “If you love a ring straight away you will probably like it above all the others that you see,” Don’t worry about buying the first ring you see if you feel it is the right one. With new interpretations of a traditional design, wedding rings are becoming exciting and fresh, allowing couples to be more daring and bold in their choices. “rings are taking an adventurous turn towards style, colour and movement.” You no longer have to settle for the traditional plain gold wedding band. For the more tradition couple the popular choice is still the matching his and hers rings. If you are planning to have matching rings make sure you shop together. Some couples will opt to have the same metal but the bride might choose to add diamonds to make her ring a little different.